The mystery in which a crime (almost always a murder) takes place behind seemingly impenetrable doors where the culprit has to all appearances vanished into thin air is probably the most enduring staple of crime fiction. Having been around since the birth of modern detective fiction (literally as Edgar Allan Poe’s Murders at the Rue Morgue is generally considered to be the first detective novel and is a locked room mystery) it’s easy to dismiss this kind of story as old-fashioned. But although they had their heyday during the Golden Age of detective fiction, people do keep re-inventing and re-imagining the theme to this very day. Just as every sci-fi writer has to have a go at depicting a dystopian future, it seems inside every crime writer (and some non crime writers) there is a locked room mystery story demanding to be told. In a bibliography entitled Locked Room Murders (last published in 1991) Robert Adey listed and described 2000 novels and short stories in this sub-genre. I have neither the in-depth knowledge nor the time to discuss quite that many examples so I’ll share just a few of the ones I like most. Please feel free to share your favourite locked room mystery in the comments. In 1981 John Dickson Carr’s The Hollow Man (1935) (a.k.a. The Three Coffins) was voted the best-ever locked room mystery by an esteemed panel of mystery writers. I’m not sure it would get my personal vote as best-ever, but it is certainly one of the purest examples of the art form, containing two variations on the locked room murder. The second of these is probably the first instance of an outdoor ‘locked room’ where the principles are applied in a completely different setting. The victim is walking alone in the middle of a snow covered London street when he is shot after a shout is heard. There are no footprints in the snow other than the victim’s but it is determined he was shot at close range. The lengthy but clever denouement is given by one of the most pompous sleuths I’ve ever come across. 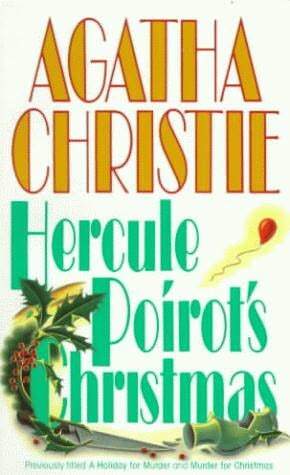 Agatha Christie has penned several locked room mysteries but my favourite is Hercule Poirot’s Christmas (1938). The house-guests of millionaire Simeon Lee hear a crash, a wailing then a scream and they rush to Lee’s room and find it locked. When they break the door down they discover Lee with his throat cut in a pool of blood and the only evidence is a bit of rubber and an odd wooden object on the floor and some overturned furniture. I like this one because Poirot has to uncover layers of family secrets in order to understand the victim before he can identify the killer and their ingenious methodology. Catherine Aird is another author to have a go at the locked room story during a long-running series. 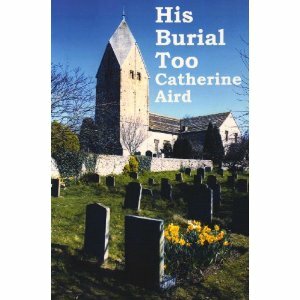 His Burial Too (1973) is the sixth of her Inspector Sloan books and takes place over the course of a single day. A man is murdered in the bell tower of a church but the room’s door is blocked by rubble and when that is cleared it seems impossible that the murderer has managed to escape. This is a bit of a gothic melodrama in some ways but enjoyable. 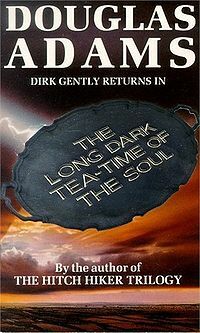 Douglas Adams even penned a locked room detective story which melds with science fiction in The Long Dark Tea Time of the Soul (1988). Adams’ hero, Dirk Gently, doesn’t feel he’ll have to do much other than listen politely to the ravings of his client when he is retained by a wealthy record industry executive who claims to be being stalked by a giant, scythe-wielding monster. Things take a dark turn for Gently’s finances (and his client’s health) when the client and his head are found several feet apart in a sealed and heavily barricaded room. When Gently belatedly takes his client’s ravings seriously, he uncovers the secret that gods who are no longer worshiped roam the earth as destitute beings and things get a bit fantastical from this point on so the book may not be accepted as a true example of the genre but I like it anyway. 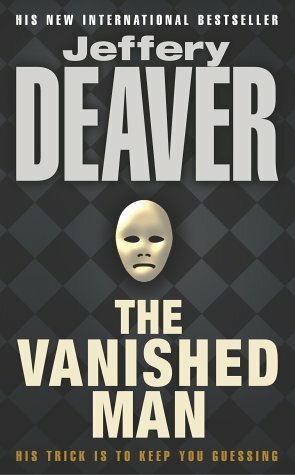 Jeffrey Deaver‘s The Vanished Man (2003) is a modern take on the old theme in which Deaver’s quadriplegic forensic specialist Lincoln Rhyme is pitted against a vanishing criminal. The murder takes place in a New York Music school and sees the murderer run from the scene only to be cornered in one of the classrooms. This is quickly surrounded by police who enter the room after hearing a shot to discover an empty room. Rhyme and his partner Amelia Sachs are required to uncover the mysteries of the magic world to solve this crime. I haven’t even started on the countless locked room short stories, like Sir Arthur Conan Doyle‘s several Holmes adventures featuring locked room scenarios including my favourite The Adventure of the Speckled Band, let alone exhausted the novels in the genre but I’ll have to leave it here. One thing that pleases me is that even though I’ve read a lot of these stories there are more to savour in my future. One I haven’t yet read is Maj Sjowall and Per Wahloo‘s The Locked Room but as it is number 8 in their 10 book series and I’m only up to book 2 it will be a while before I get there. Do you have a favourite locked room mystery? Or are you able to solve them all so quickly they don’t hold your interest? Kerrie at Mysteries in Paradise is hosting the crime fiction alphabet meme which requires the posting of an article relating to the letter of the week. Do join in the fun by reading the posts and/or contributing one of your own. You don’t have to write every week (as I have ably demonstrated by skipping H and K, though I may one day get back to them). This entry was posted in Agatha Christie, Catherine Aird, Crime Fiction Alphabet, Douglas Adams, Jeffrey Deaver, John Dickson Carr, list. Bookmark the permalink. Of course, the perfect letter L!! Some excellent choices there – and I have never read the Aird so thanks very much for that too! The first ‘Locked Room’ puzzle I remember being utterly bamboozled by is Ellery Queen’s THE CHINESE ORANGE MYSTERY so I always have to include that in my top list! Of course, it’s so hard not to just list a lot of the John Dickson Carr / Carter Dickson stories as there are so many good ones – of the latter, HE WOULDN’T KILL PATIENCE with the room sealed on the inside with tape is particularly splendid though. P.D. James’ THE LIGHTHOUSE is a variant on the locked room, as is AND THEN THERE WERE NONE, my next Agatha Christie read. even more impetus to read Ellery Queen – I don’t think I ever have and I know I should. They must have been scarce in Australia when I was growing up and doing my other ‘golden age’ reading. Bernadette – What a great idea for the letter “L!” Locked-room mysteries are really interesting. I liked Ellery Queen’s The King is Dead, but I’ve already blogged about that one. You may want to also check out the website of author Hal White . He’s assembled some great locked-room mysteries. I liked His Burial Too! The island mystery is a variant on this, eg The Girl With the Dragon Tattoo by Stieg Larsson. One of Martin Edwards’s Lake District series was a good locked room mystery without the room…The Cipher Garden. I really enjoyed the Sjowall/Wahloo “Locked Room” (referred to in your post). It would be a shame not to mention the countless locked room short stories by Edward D Hoch – The Problem of the General Store is superb, with the solution having something in common with the equally superb The Judas Window by Carter Dickson. How about the original locked-room mystery? Murders in the Rue Morgue, by Poe. It’s wonderful. And there are some Sherlock Holmes, too; I think The Case of the Speckled Room–a brilliant solution. Sjowall and Wahloo’s Locked Room is excellent, very creative; the rest of the plot is interesting, too. My Dad read John Dickson Carr as did my uncle; they loved puzzles. I must read some of these, will take your suggestion. Sorry, it’s The Case of the Speckled Band with Sherlock Holmes. Bernadette: I really enjoyed The Vanished Man. It was so clever yet believable. I thought it was one of the best in the Lincoln Rhyme series.